While the headlining Alexa controls prove a little superfluous, it doesn’t detract from what’s a great projector at this price bracket. Smart, voice activated controls for a home cinema projector may sound like the kitchen-sink approach to feature lists at first glance, jumping on the buzz-word (or should that be ‘wake word’?) bandwagon of Amazon’s Alexa, Apple’s Siri or Google’s Assistant. But think about the environment and scenario that your average projector viewing session takes place in, and it starts to make a lot of sense – you’re in a dark room where seeing buttons isn’t always easy, possibly with your hands loaded up with popcorn and other treats. Being able to shout “play the movie!” at a voice activated projector, potentially installed in a bracket high above your head, seems like a sound move. The Optoma UHD51A puts this theory into practice, and while it’s yet to perfect the Alexa experience, it’s hard to argue against its quality as a standard projector. The Optoma UHD51A can be bought for around £1,500 in the UK, and around $1,500 in the US, down from an RRP of $1,699. There’s a premium attached here against other members of the Optoma range that offer similar specs due to the Alexa inclusion – which you may find unnecessary. The UHD50 for instance is very close in spec terms, Alexa notwithstanding, and retails for under $1,400. Regardless, for the sub £2k/$2k UHD projector market, what’s on offer here is exemplary. The UHD51A is an attractive projector – in so far as the world of projectors excite with their designs. Black with silver trim, it uses a mixture of smooth and textured materials across its top side, with venting around the outside for heat management. A selection of control buttons sit along the top, while the back includes two HDMI HDCP v2.2 ports, VGA and RS232 ports, Ethernet, digital audio out, and USB port for playing back content from the projector’s built in media player. You may be frustrated to find that there’s no form of keystone correction however. While purists know that all this does (when using digital correction at least) knocks pixels off the overall image in order to straighten out the ratio, it proved frustrating trying to make minute positioning tweaks in order to get the picture size looking as it should. Note that the power cable included is quite short too, which can exacerbate this issue. Vertical lens shift is featured however, letting you raise the image above the angle that the projector sits at. Both a USB Wi-Fi adapter for Alexa support and a remote are included in the box. The remote is small and sensible laid out, though the lack of a backlight frustrates when watching in a darkened room. The Optoma UHD51A hits its 4K target using pixel shifting, delivering 8.3 million pixels from its DLP system. Capable of delivering a HDR10 image, its short throw lens can get you an image as large as 100-inches from a distance as small as around 9 feet away from the projected surface. And that image is an absolute corker, offering up a picture richer and brighter than you’d expect at this price tag, and giving the impression of brightness levels beyond the 2400 lumens quoted on the box. While you’re still going to get the best performance out of the UHD51A in a dark room, even the casual home cinema enthusiast will be able to appreciate its scale and detail if used during the day. With its rich variety of scenes and textures, the BBC’s Planet Earth 2 series on 4K Blu-Ray made the perfect test case for the UHD51A. From rich jungles to azure blue seas, the projector captured the majesty of the nature documentary, revealing pin-sharp details, sparkling light sources and inky blacks (when projecting in darkness, at least). The Optoma UHD51A can even work its magic when lighting conditions are suboptimal, as shown by this punchy 4K image of Spider-Man on a PS4 Pro, played with just the curtains drawn. Frame interpolation systems can sometimes be a little distracting, but the PureMotion set up with the UHD51A impresses, adding just enough smoothing to movement to be immersive rather than off putting. 1080p upscaling performs well too, with a range of useful picture settings (including HDR simulators, cinema and game modes) letting you get the most out of the projector depending on use case and ambient light conditions. The projector can get a little noisy when its fans kick into gear to keep the lamp cool, but not so obnoxiously as to make it impossible to enjoy what you should be listening to, too. The projector also supports 3D video – you’ll need a pair of Active DLP Link glasses to appreciate this feature, but a viewing of Werner Herzog’s Cave of Forgotten Dreams proved its worth your time if you’re still a 3D fan, with a great sense of depth and little annoying crosstalk to speak of. As for sound, the 5 watt stereo speakers on board do themselves proud – enough to watch a quick bit of TV at least. But let’s be real here – if you’re projecting a 100-inch-plus picture, they’re not going to cut it for your blockbuster marathons, so you’ll need some sort of additional sound system to get the most out of the experience. If there’s a true USP to the UHD51A, it is its Alexa support. While the projector itself doesn’t have a microphone for listening, nor the voice assistant itself built into the unit, it can be made to talk with the Amazon AI, allowing for hands free control if you have an Echo or similarly-Alexa equipped device. However, set up isn’t straight forward, as it proved difficult to get the projector online and chatting with the Echo Dot we were pairing it with. But, when the two are working together, there’s some nice touches here. For instance, setting up the projector as part of a group routine can have you both fire up the projector and dim the lights from a single voice command, while you can switch input sources, raise volume and more with other voice commands. Is this feature worth the premium over other similarly-spec’d Optoma projectors. That’s arguable, but there is a small joy in changing the settings without fumbling for a controller. The Alexa features may be fun but a little perfunctory, but everything else about this the Optoma UHD51A performs exceptionally. 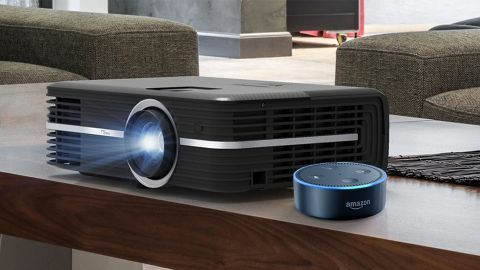 At this price you’re going to be hard pressed to find a projector that can deliver this level of picture quality and this feature set more confidently.